Data visualizations, music, maps, colors, graphs and more (neckties too?) aid in learning about weather. OK, it’s hot out. Really hot. Record-breaking hot. Record-hot-all-over-the-globe hot. Well, we feel it in our own bodies: our first and best way of knowing anything. We know it from the news: concrete, specific stories coming into our imaginations through our eyes and ears. And, though the news often doesn’t connect the dots for us, we know it in the abstract, through science: that this kind of heat is a core element of global warming. So how does a scorching day in July, 2018, fit into the longer pattern of rising temperatures? For this kind of question, for seeing meaning in data, many of us appreciate some help – especially if that help comes with a dose of aesthetic pleasure. For something a little more conventional that is still mesmerizing, see this map of rising global temperatures from NASA. Finally, if you find yourself doubting your memory, wondering whether summers now really are hotter than they used to be, you can check this excellent site from Climate Central, where you will find graphs of rising summer temperatures for cities in all 50 states (plus D.C. and Puerto Rico). This series is curated and written by retired Colorado State University English professor and close climate change watcher SueEllen Campbell of Colorado. 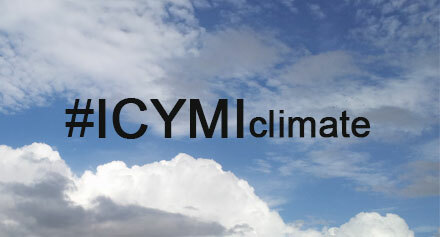 Use the Twitter hashtag #ICYMIclimate to flag works you think warrant attention, or send an e-mail to ICYMI@yaleclimateconnections.org any time. Let us hear from you.